It’s only natural to feel nervous before your first eye exam, especially after hearing the embellished stories of those who have gone before you. In reality, there is nothing scary or painful about having a routine eye exam. Rather, it is an educational experience that allows you and your eye doctor to pinpoint what your specific optical needs are and how to provide you with the best solutions possible. Whether your vision is becoming fuzzy or you are concerned about your eye health in general, scheduling your first eye exam can be an exciting first step toward improving your overall quality of life. 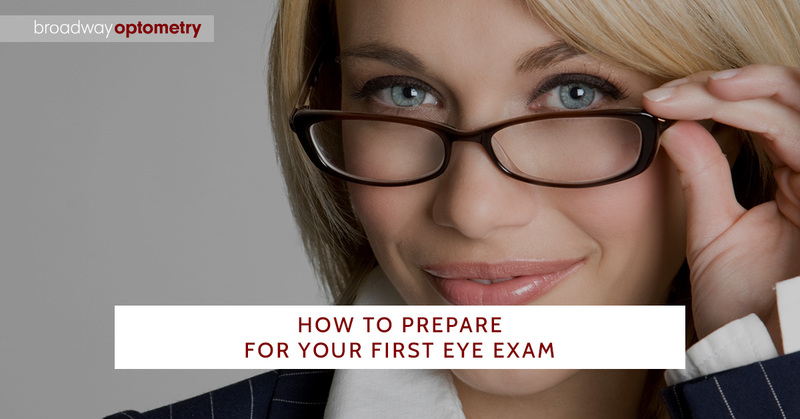 At Broadway Optometry in Chula Vista, we understand that your first trip to the eye doctor can be intimidating, so we put together a few pieces of advice to help calm your nerves before going in for your first visit. Even though it can be difficult to face the reality that you might need eyeglasses or have something more serious going on with your eyes, it is important to remember that optometrists exist for this very reason. Imagine living the rest of your life not being able to read street signs while driving or having to squint every time you read a book. It all comes down to how you perceive the costs and benefits of scheduling an eye exam, because no optical exam or procedure will leave you worse off than you already are. Plus, your nerves will be the most overwhelming before your initial visit and will fade away once you get used to scheduling routine eye exams with an optometrist you like and trust. One of the easiest ways to get some peace of mind before an upcoming eye exam is to sit down with a close friend or family member who has been to the eye doctor before and will tell you the truth about what you can expect. More often than not, people with glasses, contacts or even those who have had corrective surgery will tell you that getting over your nerves and going to your first eye doctor appointment is the most difficult step you’ll make toward correcting your vision. If they can do it, so can you! When it comes down to scheduling your first eye exam, the best way to prepare yourself for what lies ahead is to set aside some time to research optometrists in your area and choose the best fit for you. During your research, also make note of each eye doctor’s exam procedures so you can decide which clinic’s values and practices you trust the most. While some eye doctors perform basic vision tests to determine what optical problem you might be facing, we conduct one-on-one comprehensive eye exams that measure everything from your vision acuity, tracking abilities and ocular motility to your depth perception, light reflection and clarity of vision. By taking the time to measure each of these essential optical functions and communicating with you every step of the way, our team of highly-trained optometrists can determine the best solution for you with minimal stress and confusion. Knowing when to stop digging is almost as important as deciding to conduct research in the first place because, let’s face it, nearly all of us have freaked ourselves out by doing way too much research about something that causes us worry. When researching eye exam procedures online, it is important to remember that not everything on the internet is accurate and that medical procedures in particular often come across as far more complicated and intimidating than they really are. If you reach this point in your research and feel yourself worrying even more than you were before, it’s best to step away from the computer and discuss any concerns with your optometrist during your first visit. We hope this advice calms your nerves helps you prepare before scheduling your first trip to the eye doctor! If you wish to better your optical health with us, contact Broadway Optometry in Chula Vista, CA to schedule your one-on-one comprehensive eye exam today.